Some of the most exciting content came from the service providers’ experience with clients. Their real-world examples included visual recognition and machine learning. One company in the insurance field uses visual recognition to give customers a way to send photos for claims and get feedback. A consumer products organization asks expert users in their community to answer questions about their product. For the questions that appear over and over again, the expert users “teach” the AI to answer. Machine learning is an area many of the brands were interested in exploring. The service providers shared best practices to make machine learning work for CX. One panelist suggested thinking of machine learning as a smart, inexperienced apprentice who doesn’t know anything about your business but can learn. If you give it a large enough set of examples, it learns patterns well. Our service partners emphasized machine learning’s success greatly depends on the data set it uses. If the data set’s quality is questionable, corporate executives are likely to be frustrated with the outcome. Each Briefing is unique, with different attendees, panelists, and agendas. Our AI Boston Briefing started off with a panel of expert service providers answering questions from the audience of corporate executives. The AI Briefing in Atlanta (May 3, 2018), will be kicked off with a stellar presentation from UPS’ Technology and Process Senior Manager, Gil Pongetti. 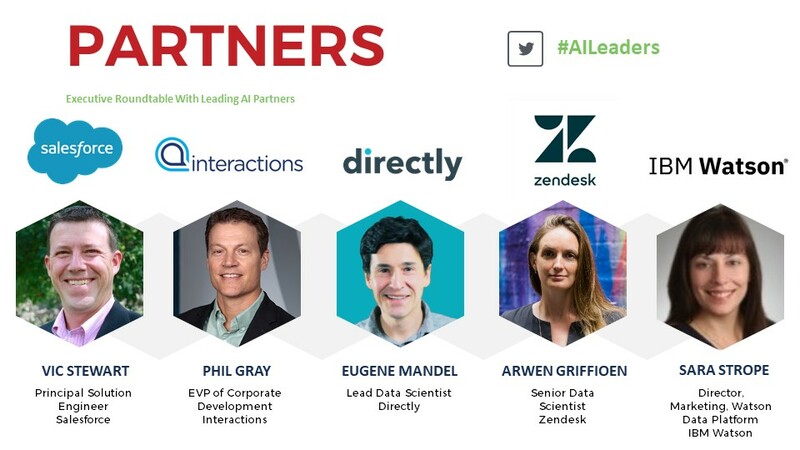 Register today to hear Gil’s perspective on AI, quiz a panel of service providers on best practices and use cases, collaborate with your peers in a corporate-only session, and see on-demand demos of the best CX solutions.